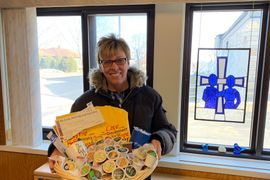 Congratulations to Barb Simonis on winning the Keurig Coffee Basket! Interfaith was able to add almost 100 new Facebook followers to their page during the campaign. Thank you to all who liked or shared the post! Interfaith relies on the support of the community to help recruit volunteers. not pictured: Kathy Powell, Dave Oreskovich, and Hattie Walker. 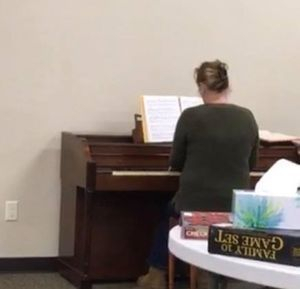 Julie Drace, plays Christmas music on our new piano at our Time For You Respite Program. Research has found that musical memories are preserved in people with advanced dementia because these parts of the brain have not been affected by the disease. At Time For You, we incorporate music in to our every day activities, helping our participants feel more at home. 715-284-7058, or contact us here!